Database Management System or DBMS in short, refers to the technology of storing and retriving users data with utmost efficiency along with safety and security features. DBMS allows its users to create their own databases which are relevant with the nature of work they want. These databases are highly configurable and offers bunch of options. Database (Data) Tier: At this tier, only database resides. Database along with its query processing languages sits in layer-3 of 3-tier architecture. It also contains all relations and their constraints. 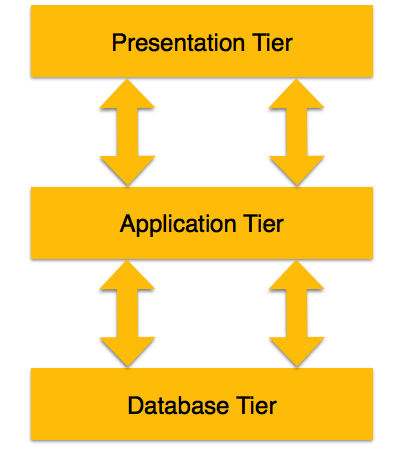 Application (Middle) Tier: At this tier the application server and program, which access database, resides. For a user this application tier works as abstracted view of database. Users are unaware of any existence of database beyond application. For database-tier, application tier is the user of it. Database tier is not aware of any other user beyond application tier. This tier works as mediator between the two. User (Presentation) Tier: An end user sits on this tier. From a users aspect this tier is everything. He/she doesn't know about any existence or form of database beyond this layer. At this layer multiple views of database can be provided by the application. All views are generated by applications, which resides in application tier.